All of the shine, none of the fuss. Super Lustrous Shiny Sheers provide the high shine and sheer color of a lipgloss with the precise application of a lipstick. Exclusive Liquisilk moisturizers give lips a silky, smooth feel. SPF 15 for added protection. In 10 sheer, shiny shades. 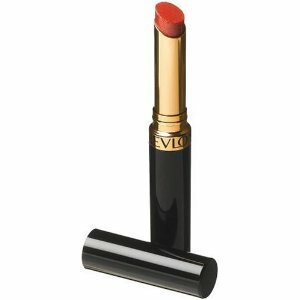 If you are looking for a sheer lipstick this is what you want. I generally don’t like glittery lipsticks but this is not so glittery. When applied on lips (check the swatches), it looks like I am wearing an orange gloss with silver shine but this gloss stays for long time. Ladies and girls with pigmented lips may not like it coz it doesn’t cover the flaws, it just adds sheer beautiful shiny color to the lips. I am not sure if this range of lipsticks has been discontinued. If yes then I really don’t get this idea of the company.